Sites that sell fake Air Max 90’s can be found all over the web and all over Facebook. Even your best mate has probably tried selling you a pair out the boot of his car. The kicks maybe fake but their techniques in making the trainers have come on a long way. No longer is it as easy as it once was to spot a fake. Some of the manufactures are able to produce a copy that looks near on identical to the real sneaker. Making even the trained sneaker heads eye wonder, are my Air Max 90’s real or fake? Fake sneakers are still copies, no genuine and of poor quality. There are a ton of ways that you can tell that your Nike Air Max 90‘s are real or fake and we’ve put them all in this post. Our guide will break down the best ways to spot a real and a fake pair of Nike sneakers! Check the box label for incorrect details and spelling. Check the inside labels details are the same as the outer. Check how well the label is attached to the shoe box. Look for defects in the tongue logo. Check the sole for poor quality and missing Nike logos. Look for an immaculately applied Air Max side logo. Check the insole logo is not faint or worn. Look for defects and poor quality to the heel logo. First: The easiest and best way to know if your 90’s are real is to purchase them from a Nike store or selected Nike retailer and not online from China. 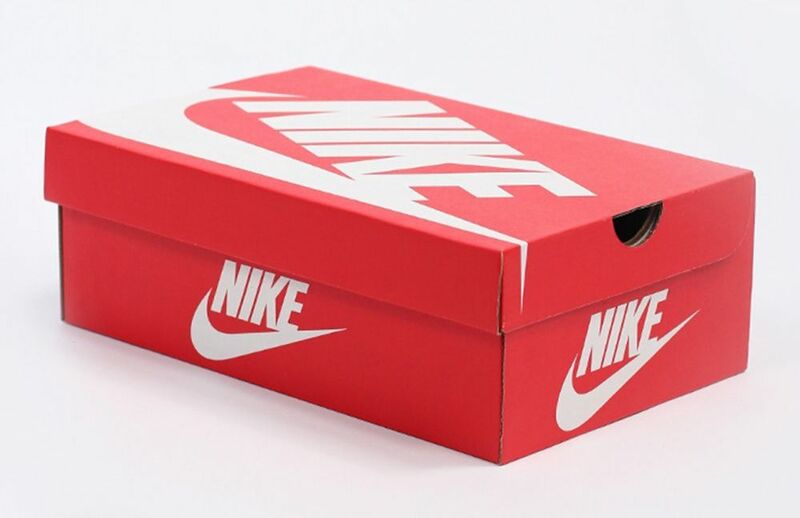 Nike always produce a quality product and like the product so is the box. Their trainers are always supplied in a strong and sturdy box. The box usually features a logo on the lid however, this does change depending on the year of release. The lid will fit tidy and flush to the box and will not be thin and flimsy. Every authentic Nike box will feature a label on the side detailing the key details of the sneaker. It will include the size, colour, name, country of manufacture and a style number. The style number will usually be 9 digits long. Take a close look at the spelling and grammar of the text on the sticker. If there spelling is incorrect the can be an easy way to spot a fake. Check the inside label for details. The details should be the same to the ones printed on the outside of the box. Fakes will often has incorrect details in key areas including the matching details on the inside tongue label. Under the Nike swoosh often non official Nike web address is printed. 4. Check how well the label is attached. Often the labels printed on the inside of the tongue are poorly attached and can often start to peel of easily. The label to should firmly stitched to the fabric of the sneaker tongue. There are some key things you can look for on the front tongue label. The label should be sewn down on all four sides of the label. The detailing on the artwork will read Nike Air Max. Fakes will often have duplicate printing of Air Max. The tail of the Nike tick should also touch the underneath of the letter ‘E’. 6. The Air Max 90 Sole. You can check the sole of your Air Max 90’s to spot a fake Air Max 90 sneaker. Fakes can often vary in quality, but most will not live up to the standard of Nike. A easy to spot sign is to take a look at the sole of the sneaker. Often the sole will be of poor quality. The images below show clearly the difference between a genuine and fake Air Max sole. If you look closely at the sole of the trainer you can see that the fake is missing the ‘Nike’ logo. 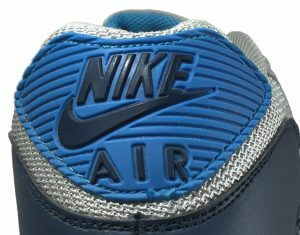 Take a look to the air max logo at the rear for of the sneaker. A genuine Air Max will have the logo applied immaculately to the sneaker. Look to see if there is any loose stitching or glue. The genuine air max will usually be of one colour and should not feel soft of rubbery. Fake sneakers often use cheap PVC so this logo can often feel cheap and soft. 8. Look for a solid printed logo on the insole. Look for a solid, well printed logo to the insole of the sneaker. Fake sneakers will often not be constructed to the same quality of a real Nike sneaker and the print to the logo on the insole can appear worn away. Real Air Max 90’s will not have a worn logo to the insole. 9. Check the paint to the heel of the sneaker around the air bubble. More commonly than not fake Air Max 90 sneakers will have poor paint work to the heel of the sneaker. Genuine Air Max detailing will not be 100% correct, however the detailing on non-genuine pairs are nearly always horrendous. 10. Poor heel logo quality. 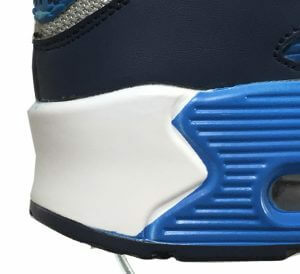 The heel of Fake Air Max sneakers also shows signs of poor build quality. The logo will often appear off centre, the stitching can also appear poor stitched with stitching interfering with the AIR letters to the logo. You will also see a obvious dip the heel logo of the real Air Max 90’s. Telling if your Air Max 90 are real or fake can often be difficult. The easiest way is just to look for imperfections. Air Max 90 sneakers are made to a high quality of which nearly all counterfeit copies can’t match. The best thing is carry out your research if purchasing Nike sneakers online from non selected Nike retailers. The shoe may appear of good quality but when inspected closely it will become obvious that it is not. Hopefully by using our guide and tips on how to spot a fake Air Max 90 you will be able to purchase your next 90 sneaker with confidence you haven’t purchased a fake. If you have any other fake sneaker tips be sure to comment them in below! We are a British premium shoelace retailer. We bring quality shoe laces that match your favorite trainers. Everyday items street or gym with original design.